Middle school isn’t easy, even in the best of circumstances, but with the addition of ever-changing technology and more pressure to be perfect, today’s teens may have it harder than ever. 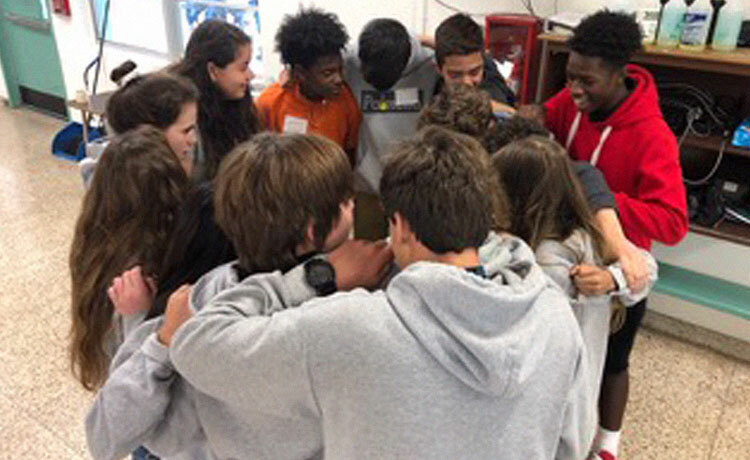 Those concerns prompted Palmetto parents (and PTSA board members) Francisca Puga and Maritza Shapiro to enlist help from A Place for Greatness to create an interactive workshop for PMS students centered around diversity and inclusion. We spoke with Puga and Shapiro to learn more about the unique program. TFV: How did the idea come about and how did the school respond? FP & MS: The incident at Parkland prompted our PTSA to engage in a number of discussions about what our school can do to help kids feel more connected to their peers and communities. We noted that middle school is an especially difficult time for many kids. It’s a big period of transition, and peer influence seems to be at its peak. The PTSA felt that it was a crucial time to present students with opportunities to connect with other kids who may not be part of their social groups at school. We wanted to create an awareness in the students and instill in them the notion that our differences enrich our social groups and communities in many ways. It is important for the students to understand that if they took the time to get to know each other, they would recognize that they have things in common and that would open the door to creating a sense of belonging and connection. When we discussed our ideas with our principal, Mr. Jesus Gonzalez, he was open to the suggestions and welcomed the ideas. He was instrumental in helping us organize the logistics of the workshop and getting the staff and student body excited about the program. TFV: How did you connect with A Place for Greatness? FP & MS: Francisca met one the founders of “A Place for Greatness”, Lia Yaffar, at a social event and was really drawn to what they were doing. Lia and co-founder, Kay McCracken, developed activity-based, life skill focused workshops that center on personal growth, improving communication and community building for adolescents. Francisca sent her own kids to a couple of their workshops and when we were discussing having a workshop at Palmetto Middle, Francisca immediately thought of them. Lia and Kay met with us on several occasions and created a program to meet our needs. One of the ideas was to have the students work in small groups, in order for them to make connections with each other. Lia and Kay came to our school and trained our wonderful parent volunteers to lead the small groups in the workshop. We were very happy with their level of commitment to our goals. Moreover, we were fortunate to have parent volunteers, administration and staff to help make the workshop a success. TFV: How many students participated and how did they react to the workshop? FP & MS: We had the majority of our eighth-grade students, approximately 300, participate in the workshop. We worked in small groups of 10-12 students. We mixed up the students so that they would be working with kids they don’t usually socialize with at school. We received feedback from a number of students who indicated it was a positive experience. The kids appreciated the fact that it was an interactive workshop and enjoyed collaborating with kids they had seen but not spoken to before. Overall, it was a wonderful experience for the students and the parent volunteers who worked with the kids. TFV: What are the main concerns for middle school students when it comes to diversity and inclusion? FP & MS: There’s tremendous pressure on kids at this age and we believe that creating opportunities for them to connect one-on-one is going to help them navigate this difficult time and to foster relationships going forward. Creating an awareness about our differences and how to find common ground is the start of connectedness which is something we all need throughout our lives. TFV: Will you do more workshops in the future and/or are you looking at other activities in relation to this topic?FP & MS: We are already working with our principal who is especially interested in having this workshop for our incoming sixth graders, as they embark on the middle school adventure together. Our students come from different schools and the workshop provides a great opportunity to make new friends and to create a school culture of inclusion. Our PTSA also recognizes that this issue is not just for the students, but for parents and the community alike. Our PTSA Board recently participated in a sensitivity training and we are creating opportunities for parents to participate in workshops on similar topics. Working together we can all make a positive impact on our children and in our community.